Proper screening materials will protect from the sun's heat, from rain, snow, high winds, UV rays, and even tame cold winter temperatures. Modern technologies have converted what was once considered as a bug screen (used solely for the purpose of keeping pesky insects out of your home) into several multipurpose screening materials (sometimes referred to as screen fabrics). Screen materials are generally identified either by their purpose value or by their density or by their their weave construction (a "17/14" weave consists of 17 strands x 14 strands per square inch). An 80% shade screen will allow 20% of sunlight rays (and wind) to penetrate. 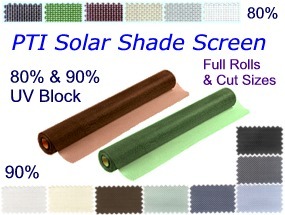 A shade screen rated at 90% impregnated with UV inhibitors (to prevent deterioration) will also tend to substantially reduce the flow of ultraviolet radiation. These multipurpose screening materials translate into categories that can fulfill the requirements of numerous projects. Shade screen that provides one way view privacy, reduces bright sunlight glare and blocks the heat from the sun. 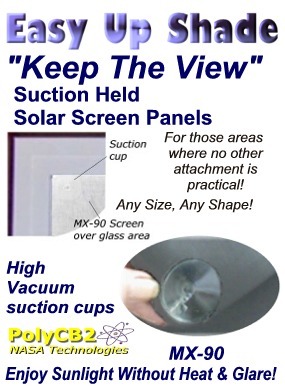 Screen treated with UV inhibitors that protect you, your furniture and your home from the damaging effects of ultra-violet radiation. Ultra strong barrier screen netting that protects pets and small children from accidents resulting from inadequate safety railings on a balcony, porch or stairwell. High-density molecular balanced non-conductive screen that insulates from both cold weather and hot weather. A porch, patio, balcony, pergola or lanai can become your oasis of outdoor living with a controlled environment. 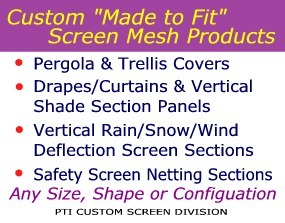 Screen with super strong fibers that will withstand wind blown debris from hurricane force winds. This high strength screening will also resist pet damage on screen doors and other areas that are subject to be torn by paws and claws. Specialty screen that prevents window reflections from creating intensely hot beams that can melt vinyl siding and burn outdoor furniture. Whether you desire to completely enhance your environment or just protect from a certain condition, there is a screen material that could very well fulfill your needs. Choosing the proper screen product for the project is all that is needed. The staff at Protect Industries is always ready to assist whether it be selecting the right screen or innovative mounting design for hard to attach areas.